All Levels of Sponsorship still available! 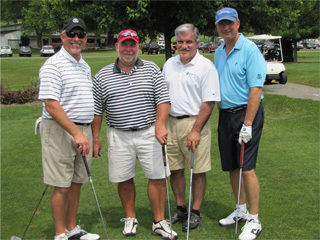 On every hole, each member of the team may hit a tee shot. The team then selects one of the tee shots from which to play. All members may then hit from that position. The procedure is repeated until the ball is holed. Each team member’s tee shot must be used at least 2 times per round (18 holes). Each team member may place his/her ball within one club length of the selected shot, but not nearer to the hole. 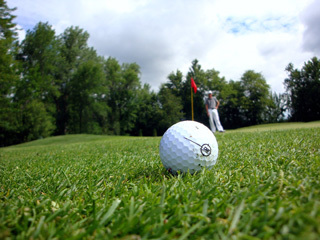 If the selected shot is played from a water hazard, bunker, primary rough, secondary rough, fairway, or fringe of the green, the ball must be played within one club length of the selected shot but no nearer to the hole, and must remain in the H2O Hazard, bunker, primary rough, secondary rough, fairway, or fringe of the green. Each team member may improve his/her lie by placing the ball or by moving it with his/her club except in a hazard. When putting, the ball must be placed within one putter head of the selected shot, no nearer to the hole. At the conclusion of the tourney, teams will be flighted by their final score. 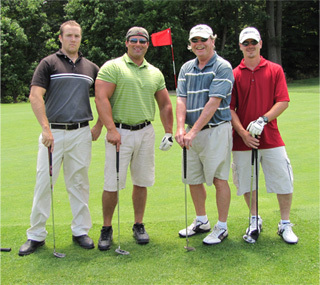 We are pleased to announce the 34th Annual Ephrata Recreation Center Golf Tournament to be held at Iron Valley Golf Club 201 Iron Valley Drive, Lebanon, PA on Wednesday, June 13, 2018. Each June this event plays a key role in our annual fundraising campaign and we expect 2018 to be a stellar year for the Rec Center and encourage you to be a part of that success. In addition to the operation of the area’s premier recreation and fitness facility, The Rec offers nearly 100 children’s programs for over 6,000 participants of our local community. The Rec administers several youth sports leagues, provides groundskeeping services to many of the local parks and sports fields, conducts the July 4th Fireworks display and provides the operative leadership of the Ephrata and Denver Community Pools. As a non-profit entity, The Rec relies heavily on contributions from generous donors like you to continue to improve the quality of life of our area by providing wholesome, affordable recreation opportunities. We encourage you to be a sponsor of this long-standing, thoroughly enjoyable spring event by selecting one of the several sponsorship options listed below. We look forward to seeing you on the 13th.